In today’s business world, email is a mission critical application which has a major impact on both revenue generation and customer satisfaction. Even with careful planning and redundant systems, occasionally email downtime happens due to failures of software (e.g. Exchange database failures, Operating System failures), hardware, network, applications, virus attacks and security breaches. When it comes to businesses, the most popular messaging and collaboration software is MS Exchange Server. 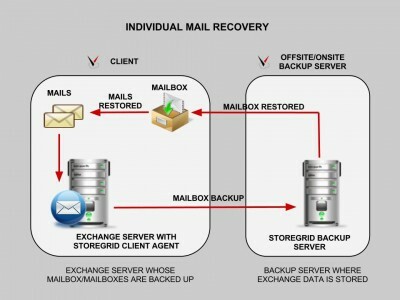 Easy and rapid individual users mailbox recovery in situations where an user loses an individual mailbox folders (like contacts, emails, calendar, tasks etc), in which case you don’t have to restore the entire server to recover exchange mailbox, thus making exchange mailbox restore simpler and easier. Rapid restore of deleted emails eliminating the need to restore the entire database, saving time and money. Rapid Exchange EDB restores to minimize recovery time objectives (RTO) and achieve fast disaster recovery and complete business continuity. 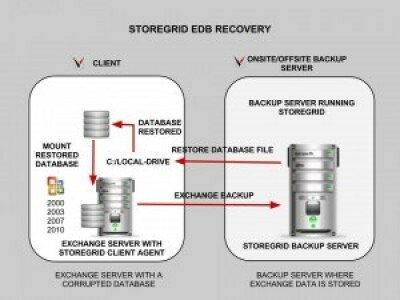 So there you have it: 3 key exchange backup and restore use cases StoreGrid delivers to achieve fast disaster recovery and complete business continuity. And our MSP partners now have an affordable, easy-to-use system that provides total disaster recovery for their SMB customers Exchange ecosystem which could a deployment of any version of MS Exchange ( 2000, 2003, 2007, 2010). The ability to continuously backup Exchange 2003/2007/2010 mailboxes and seamlessly perform server restores at granular level at all times, 365x24x7, is a top challenge and priority for MSPs and businesses. 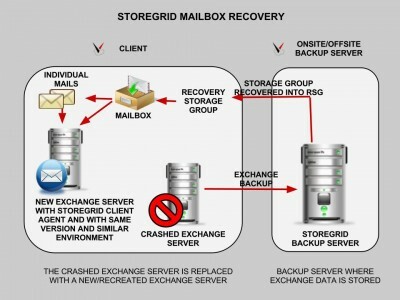 It is also very essential to simplify individual exchange mailboxes and mail server restores in the event of server corruption or disaster. Keeping this in mind, we plan to provide technical deep dive on Exchange Backup and Disaster recovery use cases and How-tos using StoreGrid in the next couple of upcoming blog posts. So share your thoughts on your Exchange backup use case and how you currently deploy StoreGrid to protect them. As always we look forward to seeing your comments and suggestions as well. Can you go into more detail on this, having a 100GB exchange database, and trying to restore that DB across the internet or even locally it may not be an easy task. Some detail steps on this would help so the product can be easily introduced to clients for recovery and at the same time it can be sold. I am looking forward to read that blog which recover over 100GB exchange database. Most of the potential customer has over 100GB Database. you would like to see on how it is handled in StoreGrid?